A total diversion from my normal subject matter – but we’ve just had a really fun afternoon that’s worth talking about. 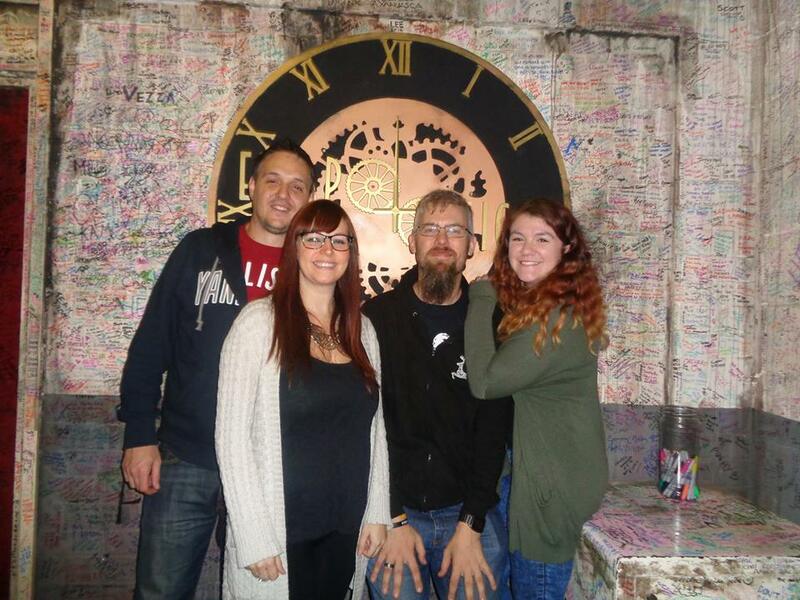 Back in March my Mum and Dad came up with the hugely original birthday gift of taking three friends and being locked in a room which we then have to try to escape from by decoding clues in there within a time limit. Given the busyness of social calendars it took ’til this week for us to finally get it locked down! So myself, Ella, Sarah and Paul met up to tackle Contraption – I was ordered by Ella that no rooms involving mannequins was allowed, and Sarah has an aversion to clowns, so when I rang up to book I made those points to the chap on the phone, and he recommended this room. It was set up as a laboratory of a scientist, machinery and artifacts make up the clues you need to eventually solve the room to escape. Our very first task proved quite tricksy to solve – it was actually pretty easy really, but then isn’t everything once you’ve worked it out? We then had a series of finding objects, cracking codes and clues and eventually finding our way out of the room with nine minutes to spare from our allotted hour. It wasn’t scary as such, but there were a few jumpy moments (especially for scaredy cat Ella!). Obviously I can’t reveal much in the way of detail – but this was an elaborately and cleverly set up puzzle – think of it as a Crystal Maze puzzle on a larger scale, and that might be close to what it’s like. A great way to work together – certainly all of our group contributed to our ultimate escape from the lab, which apparently make us suitably heirs to the mad scientist who created the room. Not that we saw the fortunes we were promised before we went in! The staff who work there are really friendly and help build the atmosphere for you – they oversee you in the room, able to feed clues to give you a nudge in the right direction if you’re really at a loss. We relied on a few of these, and of course be on hand to let you out should you freak out – there are scarier rooms on the premises that certainly Paul and I fancy, Ella and Sarah less so. It’s also given me a few ideas about team building stuff to do with work. I’d thoroughly recommending a trip to Escapologic – a fun way to spend an hour, I definitely plan on going and tackling some of the other rooms they have. It appears to be an increasingly popular thing that’s available at other places around the country too. I love the idea, really imaginative, and gets the brain working a bit too as well as the adrenaline pumping. Victorious teams get to have their photo taken infront of the logo – which is shared on the company Facebook page within a short space of time, we were also invited to make free with a Sharpie and sign the wall. Unsuccessful teams are consigned to the ‘cage of shame’ for a photograph, luckily we escaped that fate… this time, who knows what the future might bring? If you’re looking for an activity to fill some time in Nottingham that’s original and a lot of fun, you can’t really go wrong here!